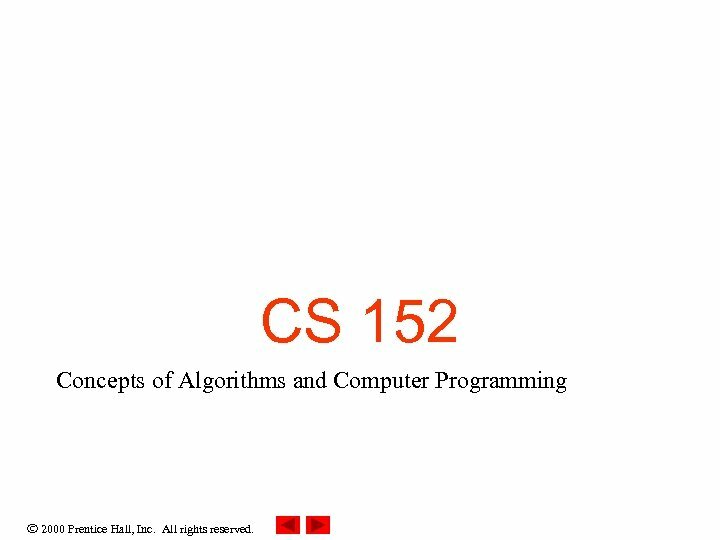 CS 152 Concepts of Algorithms and Computer Programming 2000 Prentice Hall, Inc. All rights reserved. 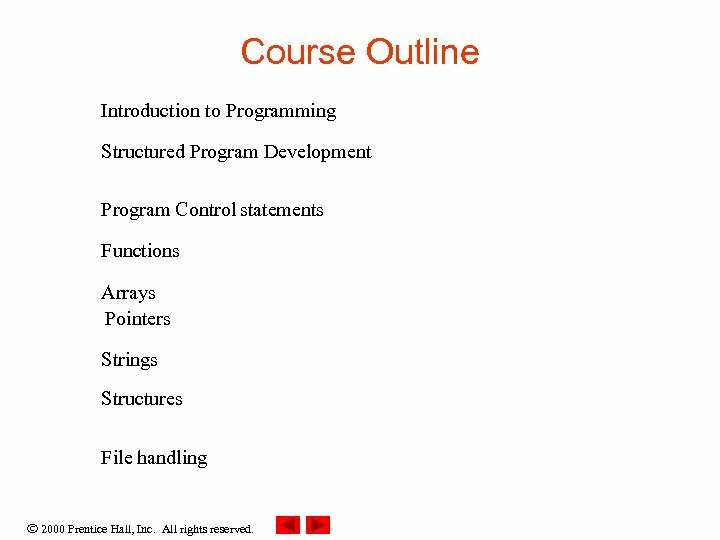 Course Outline Introduction to Programming Structured Program Development Program Control statements Functions Arrays Pointers Strings Structures File handling 2000 Prentice Hall, Inc. All rights reserved. 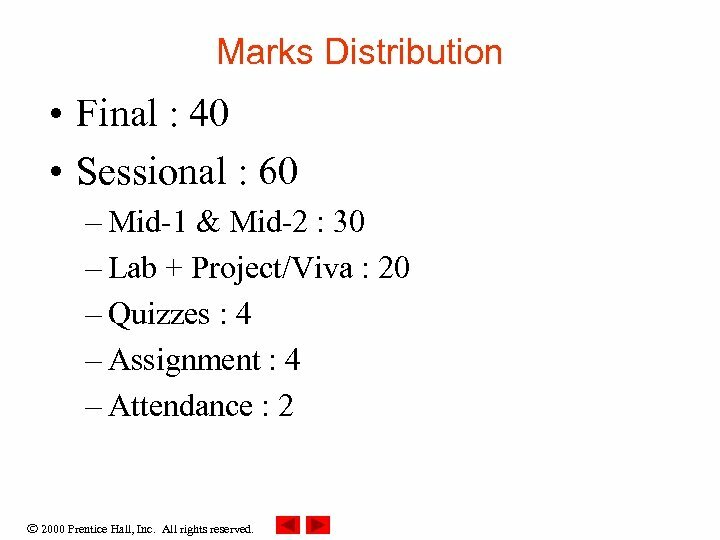 Marks Distribution • Final : 40 • Sessional : 60 – Mid-1 & Mid-2 : 30 – Lab + Project/Viva : 20 – Quizzes : 4 – Assignment : 4 – Attendance : 2 2000 Prentice Hall, Inc. All rights reserved. Chapter 1 – Introduction Outline 1. 1 1. 2 1. 3 1. 4 1. 5 1. 6 1. 7 1. 8 1. 9 1. 10 1. 11 1. 12 1. 13 1. 14 1. 15 1. 16 1. 17 1. 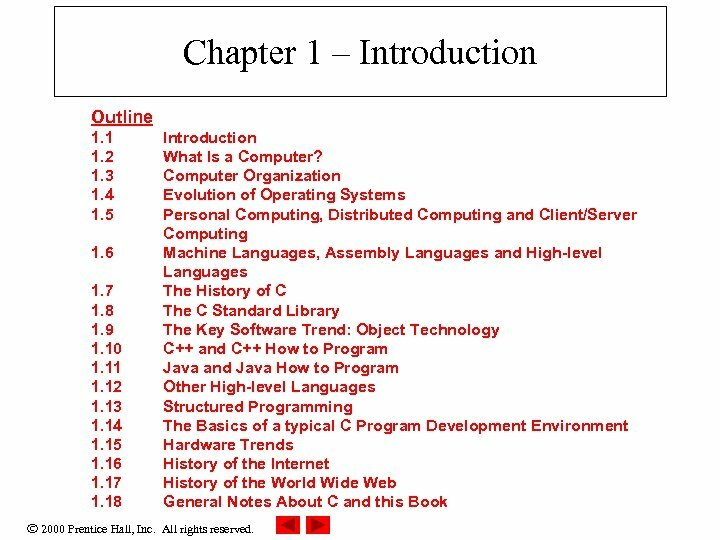 18 Introduction What Is a Computer? Computer Organization Evolution of Operating Systems Personal Computing, Distributed Computing and Client/Server Computing Machine Languages, Assembly Languages and High-level Languages The History of C The C Standard Library The Key Software Trend: Object Technology C++ and C++ How to Program Java and Java How to Program Other High-level Languages Structured Programming The Basics of a typical C Program Development Environment Hardware Trends History of the Internet History of the World Wide Web General Notes About C and this Book 2000 Prentice Hall, Inc. All rights reserved. 1. 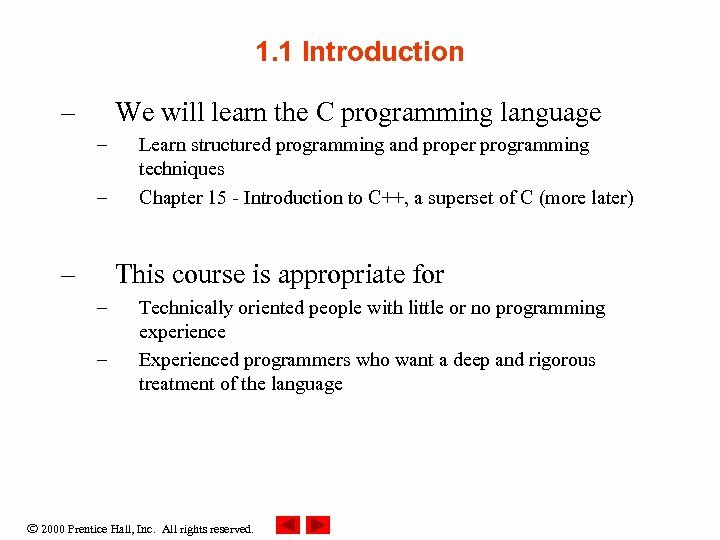 1 Introduction – We will learn the C programming language – – – Learn structured programming and proper programming techniques Chapter 15 - Introduction to C++, a superset of C (more later) This course is appropriate for – – Technically oriented people with little or no programming experience Experienced programmers who want a deep and rigorous treatment of the language 2000 Prentice Hall, Inc. All rights reserved. 1. 2 What is a Computer? 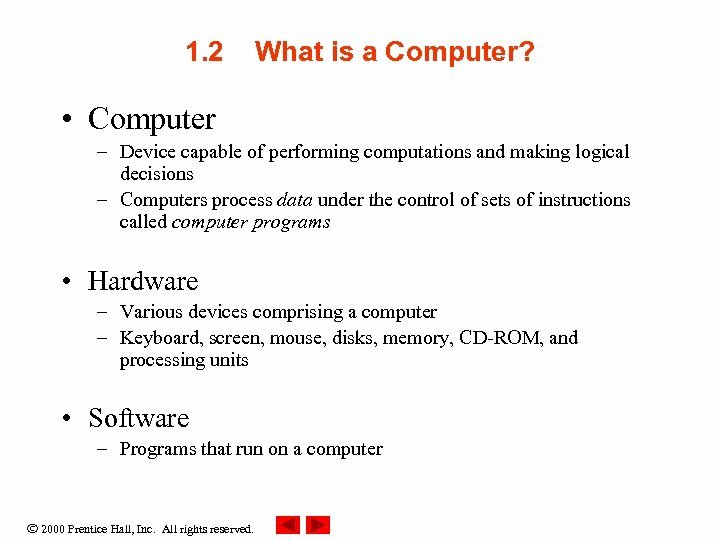 • Computer – Device capable of performing computations and making logical decisions – Computers process data under the control of sets of instructions called computer programs • Hardware – Various devices comprising a computer – Keyboard, screen, mouse, disks, memory, CD-ROM, and processing units • Software – Programs that run on a computer 2000 Prentice Hall, Inc. All rights reserved. 1. 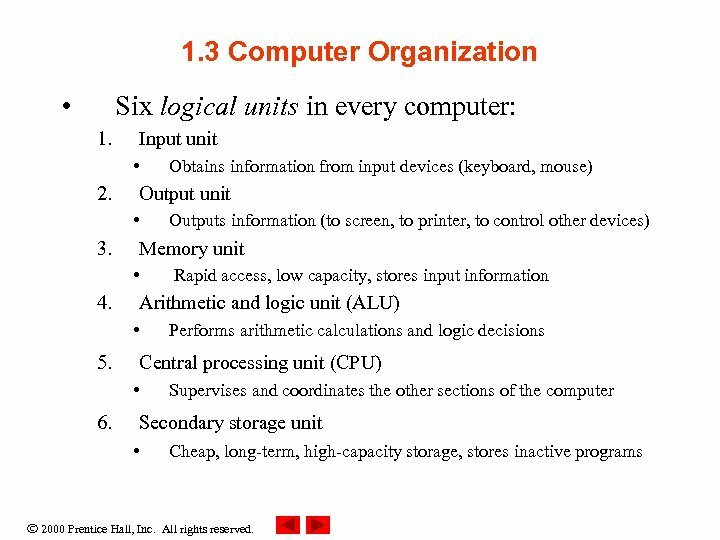 3 Computer Organization • Six logical units in every computer: 1. Input unit • 2. Output unit • 3. Performs arithmetic calculations and logic decisions Central processing unit (CPU) • 6. Rapid access, low capacity, stores input information Arithmetic and logic unit (ALU) • 5. Outputs information (to screen, to printer, to control other devices) Memory unit • 4. Obtains information from input devices (keyboard, mouse) Supervises and coordinates the other sections of the computer Secondary storage unit • Cheap, long-term, high-capacity storage, stores inactive programs 2000 Prentice Hall, Inc. All rights reserved. 1. 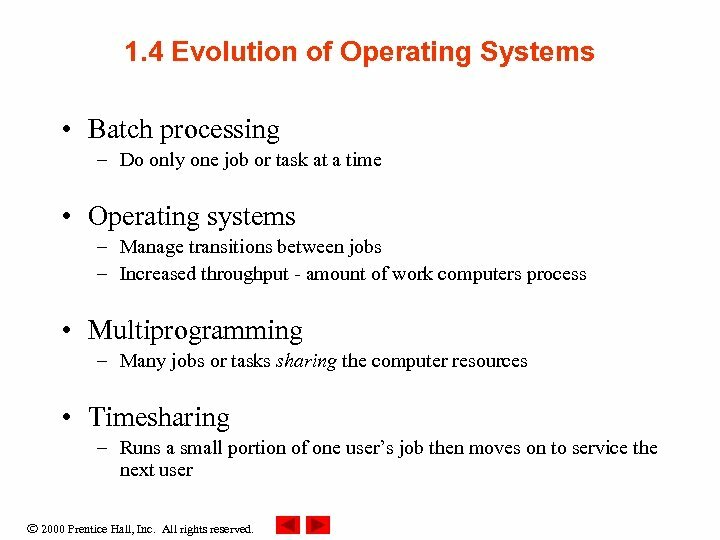 4 Evolution of Operating Systems • Batch processing – Do only one job or task at a time • Operating systems – Manage transitions between jobs – Increased throughput - amount of work computers process • Multiprogramming – Many jobs or tasks sharing the computer resources • Timesharing – Runs a small portion of one user’s job then moves on to service the next user 2000 Prentice Hall, Inc. All rights reserved. 1. 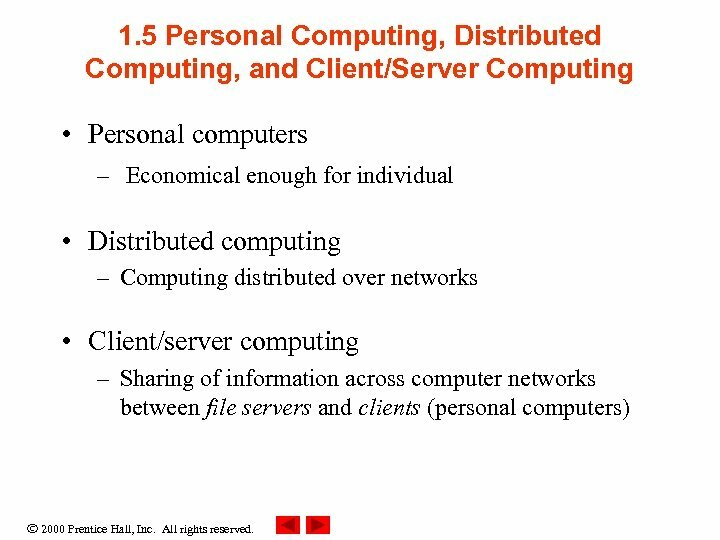 5 Personal Computing, Distributed Computing, and Client/Server Computing • Personal computers – Economical enough for individual • Distributed computing – Computing distributed over networks • Client/server computing – Sharing of information across computer networks between file servers and clients (personal computers) 2000 Prentice Hall, Inc. All rights reserved. 1. 6 Machine Languages, Assembly Languages, and High-level Languages • Three types of programming languages 1. Machine languages – – Strings of numbers giving machine specific instructions Example: +1300042774 +1400593419 +1200274027 2. 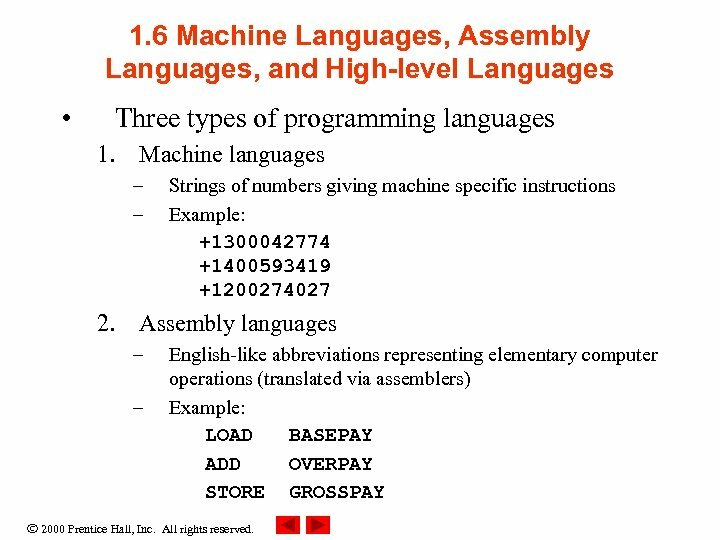 Assembly languages – – English-like abbreviations representing elementary computer operations (translated via assemblers) Example: LOAD BASEPAY ADD OVERPAY STORE GROSSPAY 2000 Prentice Hall, Inc. All rights reserved. 1. 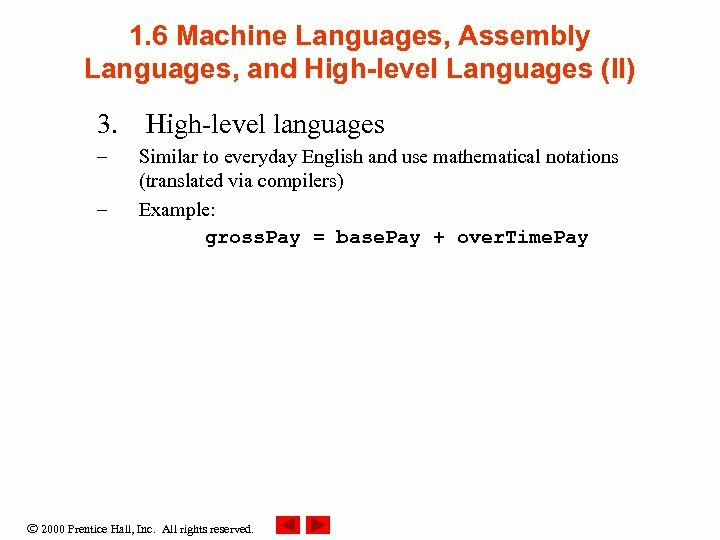 6 Machine Languages, Assembly Languages, and High-level Languages (II) 3. High-level languages – – Similar to everyday English and use mathematical notations (translated via compilers) Example: gross. Pay = base. Pay + over. Time. Pay 2000 Prentice Hall, Inc. All rights reserved. 1. 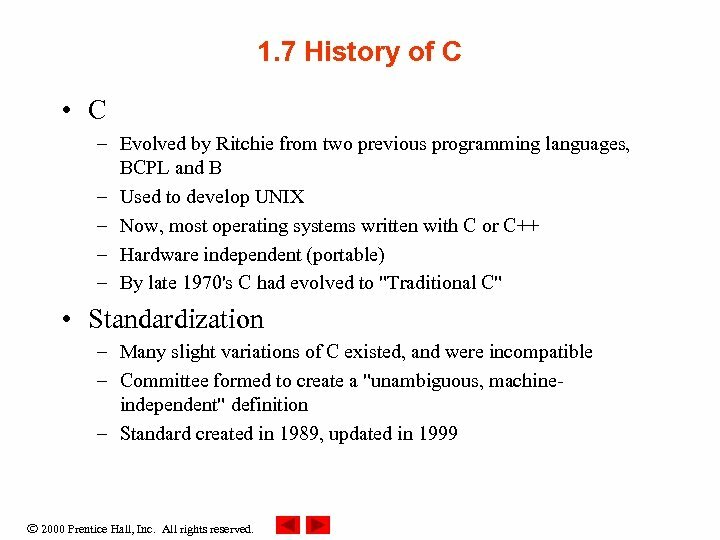 7 History of C • C – Evolved by Ritchie from two previous programming languages, BCPL and B – Used to develop UNIX – Now, most operating systems written with C or C++ – Hardware independent (portable) – By late 1970's C had evolved to "Traditional C" • Standardization – Many slight variations of C existed, and were incompatible – Committee formed to create a "unambiguous, machineindependent" definition – Standard created in 1989, updated in 1999 2000 Prentice Hall, Inc. All rights reserved. 1. 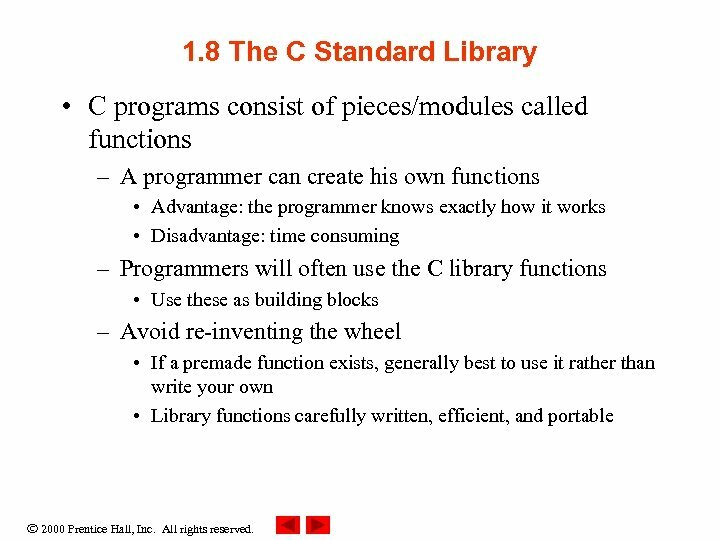 8 The C Standard Library • C programs consist of pieces/modules called functions – A programmer can create his own functions • Advantage: the programmer knows exactly how it works • Disadvantage: time consuming – Programmers will often use the C library functions • Use these as building blocks – Avoid re-inventing the wheel • If a premade function exists, generally best to use it rather than write your own • Library functions carefully written, efficient, and portable 2000 Prentice Hall, Inc. All rights reserved. 1. 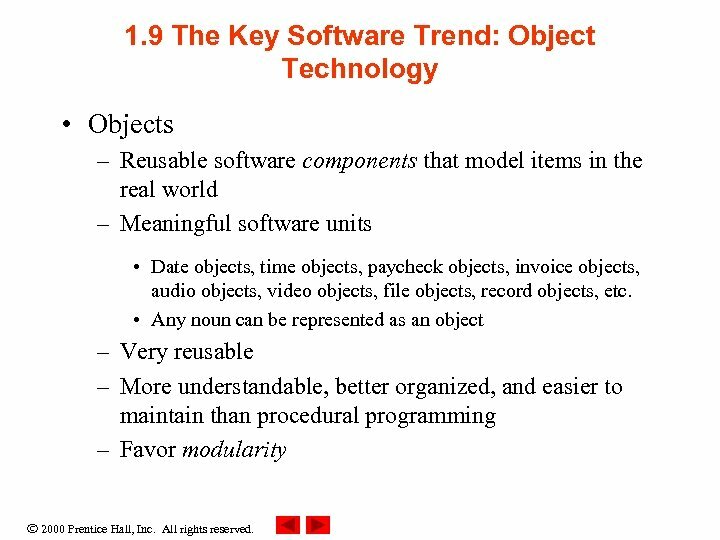 9 The Key Software Trend: Object Technology • Objects – Reusable software components that model items in the real world – Meaningful software units • Date objects, time objects, paycheck objects, invoice objects, audio objects, video objects, file objects, record objects, etc. • Any noun can be represented as an object – Very reusable – More understandable, better organized, and easier to maintain than procedural programming – Favor modularity 2000 Prentice Hall, Inc. All rights reserved. 1. 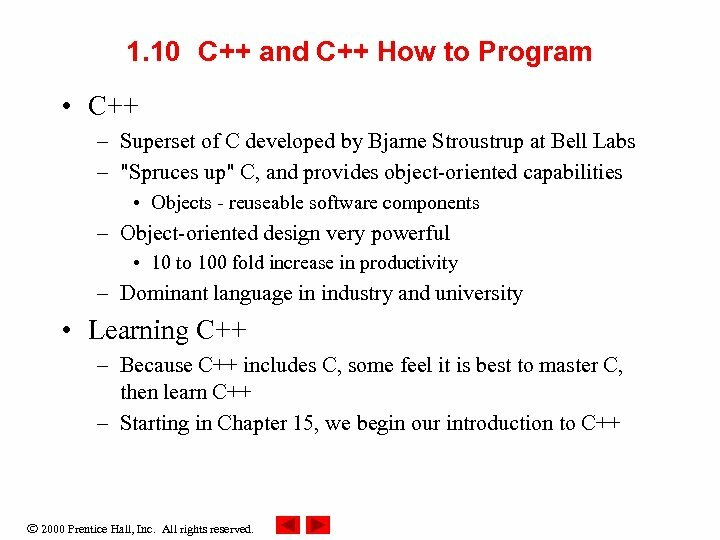 10 C++ and C++ How to Program • C++ – Superset of C developed by Bjarne Stroustrup at Bell Labs – "Spruces up" C, and provides object-oriented capabilities • Objects - reuseable software components – Object-oriented design very powerful • 10 to 100 fold increase in productivity – Dominant language in industry and university • Learning C++ – Because C++ includes C, some feel it is best to master C, then learn C++ – Starting in Chapter 15, we begin our introduction to C++ 2000 Prentice Hall, Inc. All rights reserved. 1. 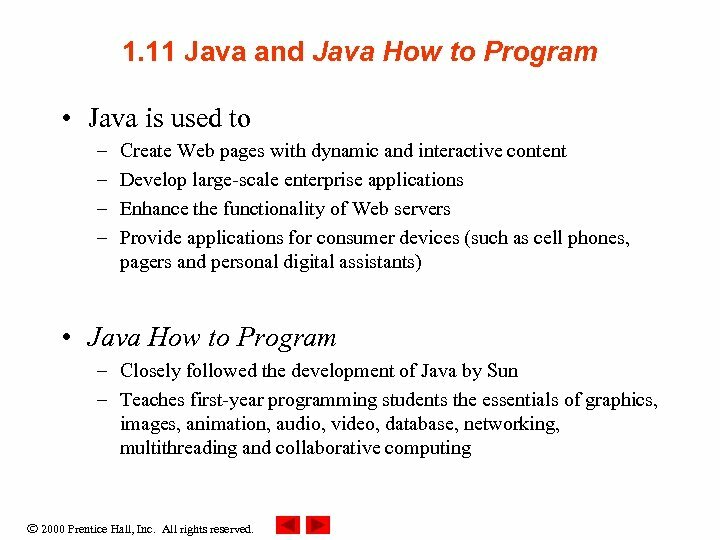 11 Java and Java How to Program • Java is used to – – Create Web pages with dynamic and interactive content Develop large-scale enterprise applications Enhance the functionality of Web servers Provide applications for consumer devices (such as cell phones, pagers and personal digital assistants) • Java How to Program – Closely followed the development of Java by Sun – Teaches first-year programming students the essentials of graphics, images, animation, audio, video, database, networking, multithreading and collaborative computing 2000 Prentice Hall, Inc. All rights reserved. 1. 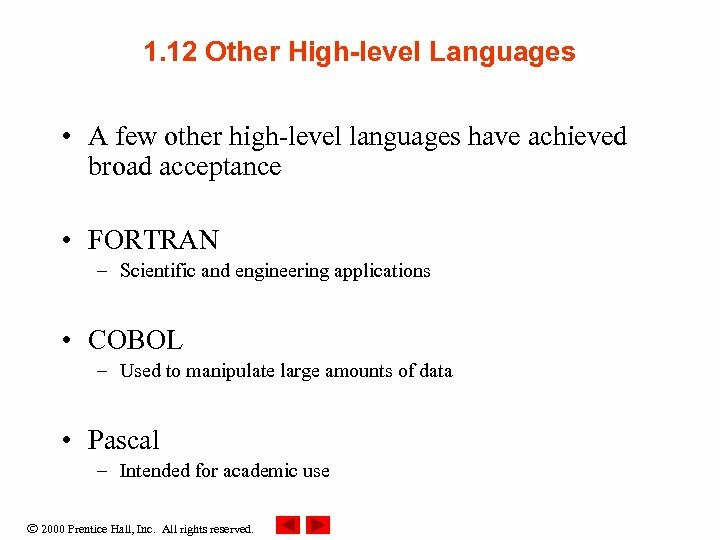 12 Other High-level Languages • A few other high-level languages have achieved broad acceptance • FORTRAN – Scientific and engineering applications • COBOL – Used to manipulate large amounts of data • Pascal – Intended for academic use 2000 Prentice Hall, Inc. All rights reserved. 1. 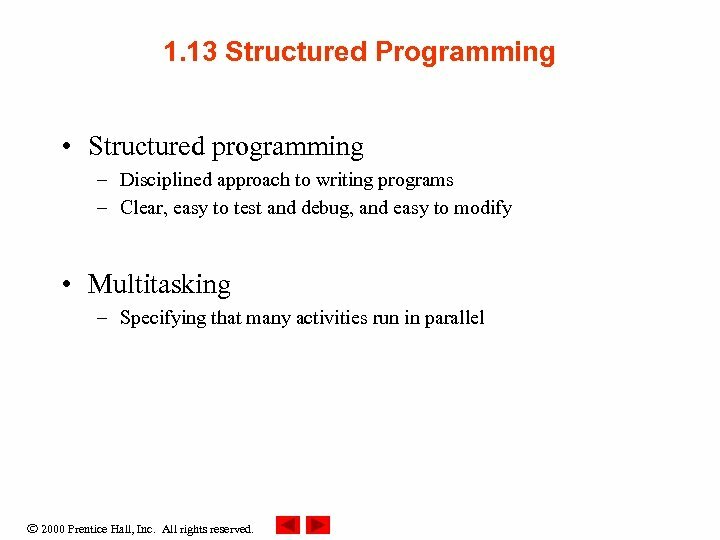 13 Structured Programming • Structured programming – Disciplined approach to writing programs – Clear, easy to test and debug, and easy to modify • Multitasking – Specifying that many activities run in parallel 2000 Prentice Hall, Inc. All rights reserved. 1. 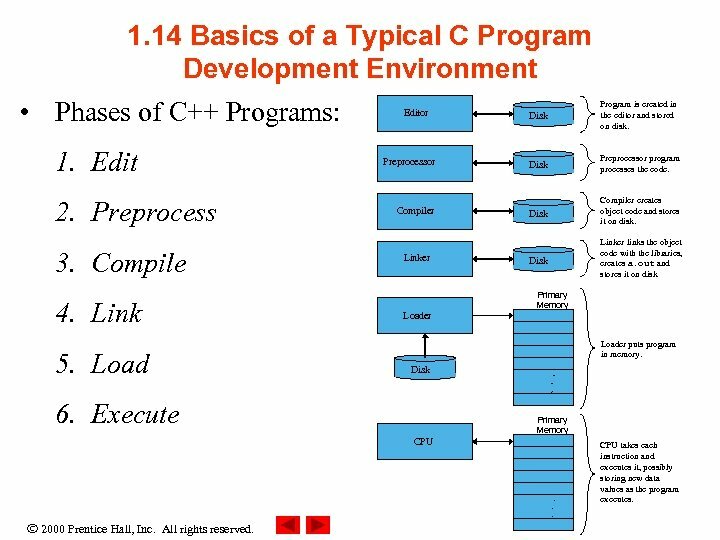 14 Basics of a Typical C Program Development Environment • Phases of C++ Programs: 1. Edit 2. Preprocess 3. Compile 4. Link 5. Load Editor Preprocessor Compiler Linker Loader Disk Program is created in the editor and stored on disk. Disk Preprocessor program processes the code. Disk Compiler creates object code and stores it on disk. Disk Linker links the object code with the libraries, creates a. out and stores it on disk Primary Memory Loader puts program in memory. Disk 6. Execute . . . Primary Memory CPU 2000 Prentice Hall, Inc. All rights reserved. . . . CPU takes each instruction and executes it, possibly storing new data values as the program executes. 1. 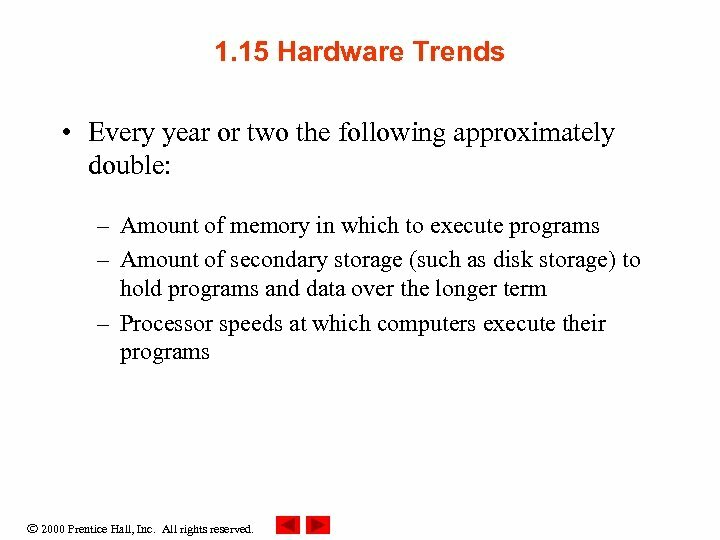 15 Hardware Trends • Every year or two the following approximately double: – Amount of memory in which to execute programs – Amount of secondary storage (such as disk storage) to hold programs and data over the longer term – Processor speeds at which computers execute their programs 2000 Prentice Hall, Inc. All rights reserved. 1. 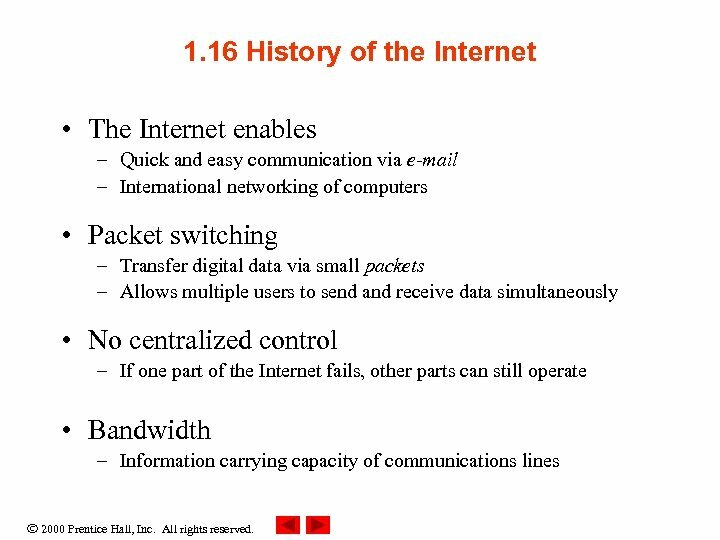 16 History of the Internet • The Internet enables – Quick and easy communication via e-mail – International networking of computers • Packet switching – Transfer digital data via small packets – Allows multiple users to send and receive data simultaneously • No centralized control – If one part of the Internet fails, other parts can still operate • Bandwidth – Information carrying capacity of communications lines 2000 Prentice Hall, Inc. All rights reserved. 1. 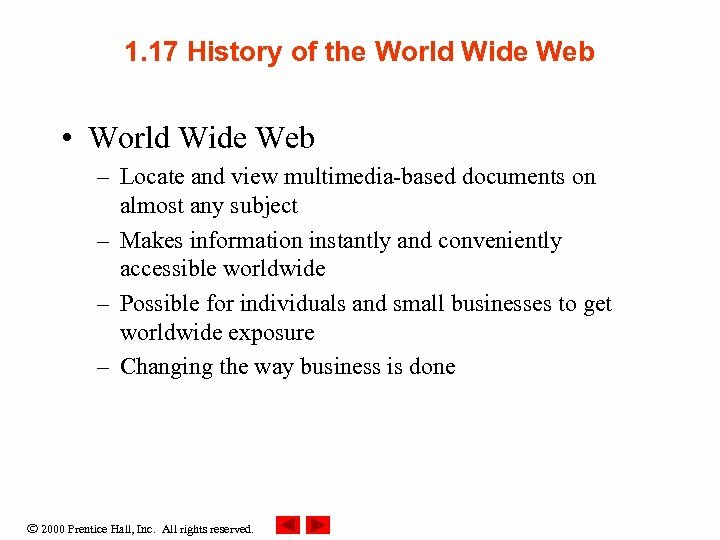 17 History of the World Wide Web • World Wide Web – Locate and view multimedia-based documents on almost any subject – Makes information instantly and conveniently accessible worldwide – Possible for individuals and small businesses to get worldwide exposure – Changing the way business is done 2000 Prentice Hall, Inc. All rights reserved. 1. 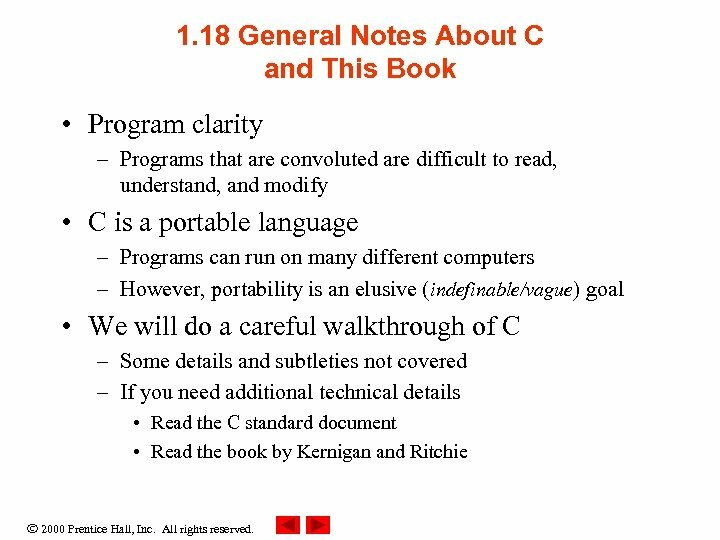 18 General Notes About C and This Book • Program clarity – Programs that are convoluted are difficult to read, understand, and modify • C is a portable language – Programs can run on many different computers – However, portability is an elusive (indefinable/vague) goal • We will do a careful walkthrough of C – Some details and subtleties not covered – If you need additional technical details • Read the C standard document • Read the book by Kernigan and Ritchie 2000 Prentice Hall, Inc. All rights reserved.